Those up to date with Vikings will know that Bjorn has finally come to terms with the fact that he longer loves his wife, unfortunately he has moved on a little too quickly and has fallen for Princess Snaefrid of the Sami. Snaefrid is loosely based on Snæfrith, the lover of Harald Finehair and the ancestor of Harald Hardrada. This does not bode well since Harald Finehair is currently about to wage war against Bjorn’s faction. 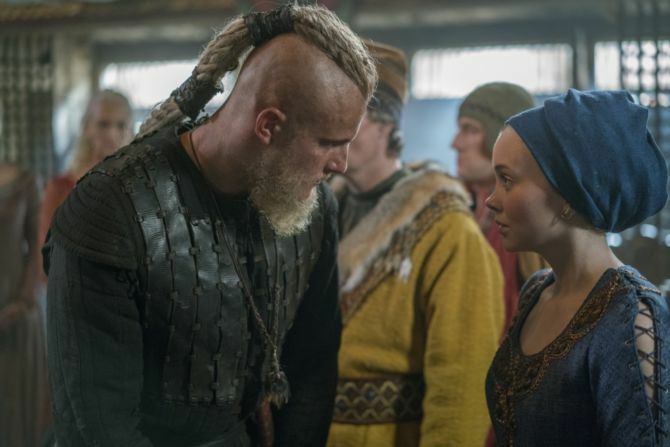 In the Saga’s she was rumored to be enable to ensnare men and with her connection to Harald, you gotta wonder is she going to betray Bjorn or is her father planning on doing this,? At this point we are unsure of how this will go. What we know is that she is a little kinkier than what Bjorn is used to and may have a sadistic side to her. I really hope that this is not the beginning of the end for Lagertha and Bjorn.